This is the third in a series of blog posts on mid-19th century courtship and wedding customs. Click for Part One, on 19th century Courtship, and Part Two, on Marriage Proposals and Engagements. Imagine the excitement in the family room of the Tredwell home on a spring evening in late March, 1845. Elizabeth, the eldest daughter of Seabury and Eliza Tredwell, had just named Wednesday, April 9, as the date of her wedding to Effingham Nichols. One can picture Elizabeth and her betrothed, perhaps along with her mother, Eliza, and her sister Mary, seated around the table in the family room, composing the guest list and writing out the wedding invitations. The wedding was only two weeks away, and so much needed to be done! The Tredwell family was about to leap head-on into what one contemporary etiquette manual referred to as “the whirl and vortex” of a wedding. This post will address three important aspects of mid-19th century wedding planning: invitations, the trousseau, and the duties of the groom. Elizabeth and Effingham were married in 1845, at a time when the form of the American wedding was gradually transitioning from a simple, family-centered, informal celebration to an elaborate, public, and expensive spectacle. We have no record of their wedding, so it is impossible to know the location, format, or style of their festivities. Seabury, however, given his wealth and social status, could afford to give his eldest and first-wed daughter an elaborate wedding with all the trimmings. “The Wedding,” 1855, by John Forrest. Up until the mid-19th century, the “wedding industry” (as the providers of services and goods for weddings are collectively known today), barely existed. Because a home wedding was the standard, and the bride’s family hosted the reception, gatherings were usually small and intimate. Many of the items in the bride’s trousseau were made by hand by family members, and the wedding dress was usually the work of a reputable dressmaker known to the family. New York City newspapers from the 1840s featured no advertisements for dedicated commercial wedding “vendors,” or professionals who furnish the trappings of an elaborate wedding. Whereas florists, jewelers, confectioners, and dry goods stores existed, very few items, save for wedding attire, were marketed with a specific eye to wedding celebrations. This would all change in the late 1850s and especially after the Civil War, as the wedding industry became a huge commercial enterprise, and wedding rituals, especially among upper class families, became more formal, public, and elaborate. Businesses sprang up to cater to the needs of the bride-to-be, including stores that offered ready-to-wear bridal dresses and complete trousseaus. Women were faced with many more choices to consider in every aspect of their wedding, and therefore required more time to shop and plan. Moving the ceremony from the home to a church, along with, some years later, the option of holding the reception in a grand hotel, meant that many more guests could be accommodated; hence, guest lists grew accordingly. 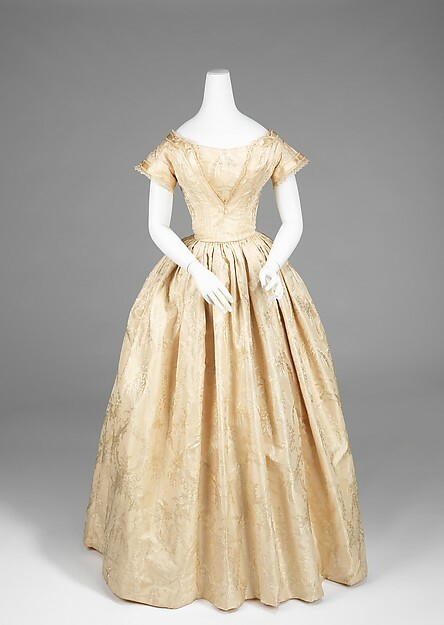 Silk Wedding Dress, American, 1845-1850, Metropolitan Museum of Art 2009.300.920a, b. According to wedding etiquette manuals and contemporary diaries, in the first half of the nineteenth century wedding invitations were sent out anywhere from four days to two weeks prior to the wedding date. This short span of time between the date of the invitation and the actual wedding date reflects the simplicity of the wedding form and the minimal advance planning it necessitated. We know neither the size of the guest list for Elizabeth and Effingham’s wedding, nor the names of those invited. Both the Tredwell and Nichols families were wealthy and prominent members of elite New York society. Both had large extended families; Seabury had many former business associates; Effingham had colleagues; and undoubtedly both families had a large circle of friends. So chances are the guest list was long, especially since the Tredwells could accommodate a large gathering in their Greek Revival double parlors, and guests were accustomed to having to cram into the indoor spaces for the festivities. A Sociable, or a Wedding? 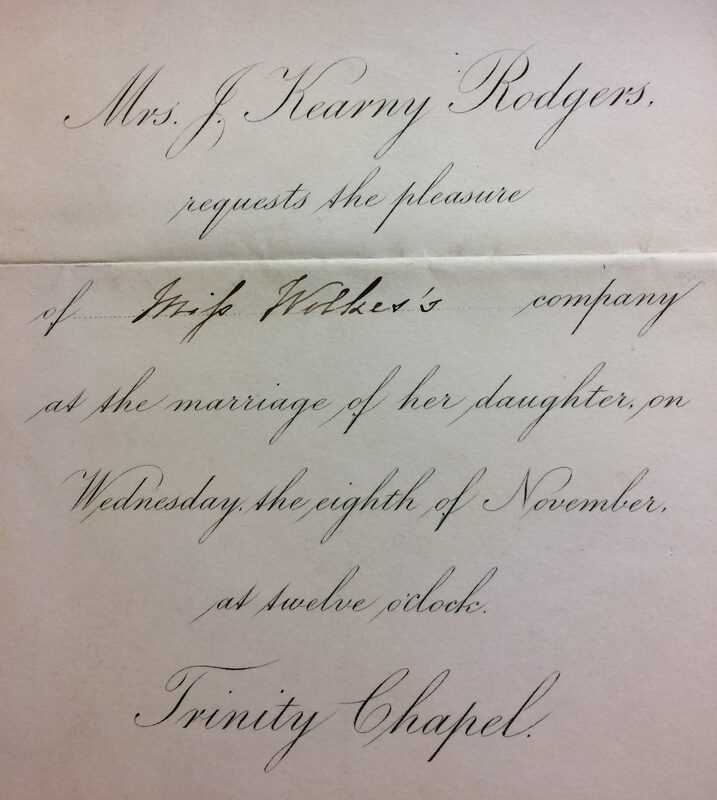 Wedding Invitation, 1854, Floyd-Jones Papers, New York Historical Society. “Mr. And Mrs. D.R. Floyd-Jones request the pleasure of Mr. and Mrs. L.W. Jones’ company on Tuesday evening, 25th just at 8 1/2 o’clock. As the bride was married at her parents’ home, mentioning that a wedding was to take place was deemed unnecessary. Note the evening hour, 8:30 p.m., which was typical for a home wedding. In the 1840s, wedding invitations were hand written in a fancy cursive script on white card stock. This was hardly a challenge for well-educated young ladies; excellent penmanship was considered an essential requirement for completion of finishing school. Engraved and printed invitations did not become popular until the early 1860s; ten years later, in keeping with the formality and grandeur of the wedding itself, and more practical given the longer guest lists, such mass produced invitations became de rigueur. 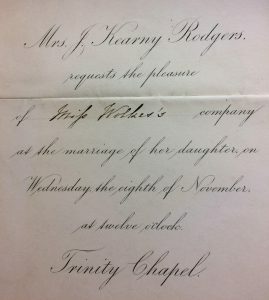 Note the engraved invitation (pictured at right) to the 1865 wedding of the daughter of Mrs. J. Kearny Rodgers at Trinity Chapel. Despite the formality of the style, the bride-to-be’s name is not mentioned. One assumes that Mrs. Rodgers had only one daughter! The custom of a bridal trousseau, i.e. 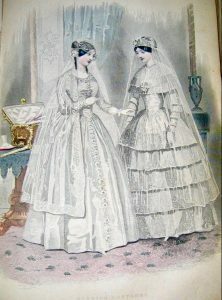 the clothing and “soft goods” (such as bed and table linens) that a bride brought to her marriage, became increasingly popular in the mid-19th century. The size of a trousseau depended on the family’s wealth and the position the couple would be assuming in society. For Elizabeth, as the wife of a well-to-do attorney who no doubt had many social obligations, a proper trousseau consisted of a lady’s complete wardrobe (including the wedding gown) sufficient for at least an entire year. This elaborate trousseau assemblage undoubtedly occupied most of Elizabeth’s time prior to her wedding. Louis Vuitton. 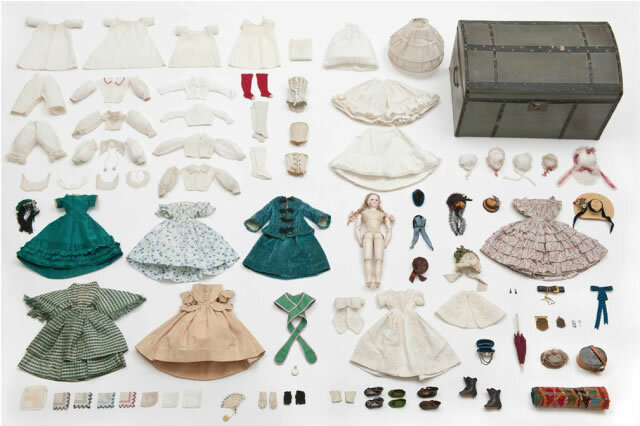 Doll, Trousseau, and Its Trunk, 1865. Les Arts Decoratif. Elizabeth no doubt received a sum of money from her father with which to purchase her trousseau. It is impossible to know the cost of a trousseau in 1845, as it varied depending on the family’s social status and financial resources. In 1850, Godey’s Lady’s Book estimated that the cost of the wedding dress and veil alone to be $650. Add to that all the other complements of the trousseau, and one may safely assume that the amount spent on a trousseau by a wealthy family like the Tredwells would be upwards of $1,000 (approximately $30,000 today). 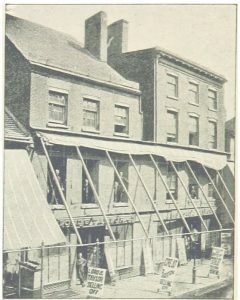 Lord and Taylor, original store, Catherine Street, 1834-1854. Upon the announcement of her engagement, Elizabeth, assisted by her mother, sisters, and close friends, likely commenced sewing many of the personal items included in the trousseau, such as petticoats, corset covers, nightgowns, dress sleeves, and handkerchiefs. 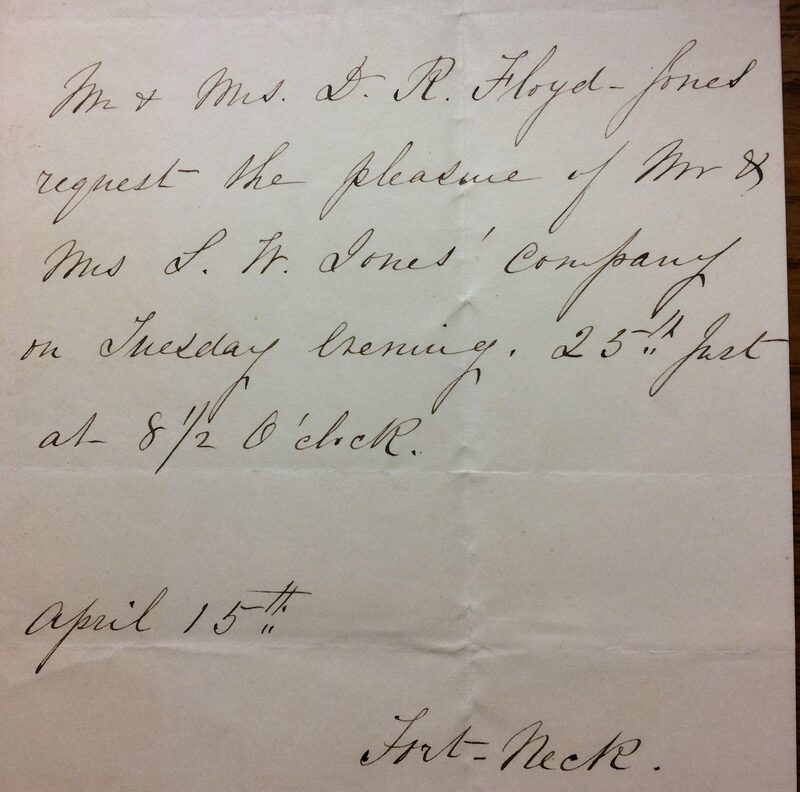 Once her wedding date was set, the shopping began with a vengeance at popular dry-goods stores, such as A.T. Stewart, then located on Broadway near Chambers Street, and Lord and Taylor, then located on Catherine Street. These emporiums stocked many trousseau items in addition to dresses, such as sewing implements, linens, shawls, slippers, and hair combs and brushes. Wedding Costume, Godey’s Lady’s Book, 1840. According to the August 1849 issue of Godey’s Lady’s Book, the “etiquette of trousseau” dictated that a fashionable wedding dress be made of white silk or satin, with a Brussels lace over-dress with a fitted bodice and full skirt. A white veil, long and full, and most likely made of Brussels lace, was attached to an artificial wreath of orange blooms (popularized by Queen Victoria, who wore them at her wedding in 1840) that encircled the head. 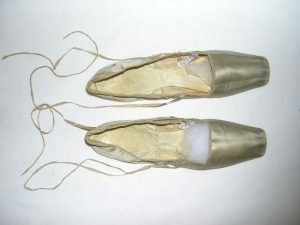 Flat white satin or silk slippers decorated with ribbons; white silk stockings; short white kid gloves; and an embroidered handkerchief (perhaps with interlaced initials of the bride and groom), completed the ensemble. Eliza Tredwell most likely hired a dressmaker to create Elizabeth’s wedding ensemble. The seamstress may have lived with the family for a few weeks before the wedding, sewing the dresses in return for room and board, or for a set fee. 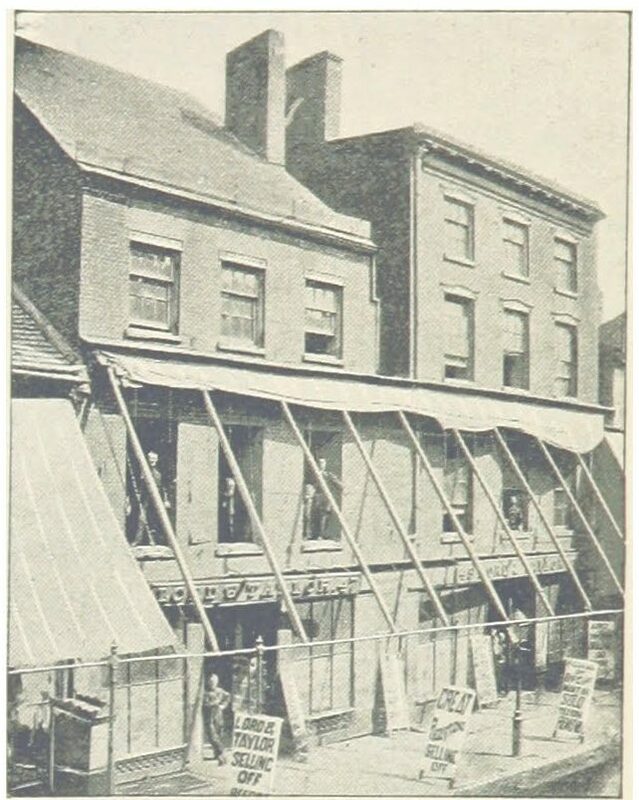 Imagine the excitement with which Elizabeth and her mother examined the latest silk and satin fabrics, imported from France and widely available at the many dry-good stores that catered to ladies’ fashions, such as H. Myers & Gedney, located at 375 Broadway. James Beck & Co., and William A. Smets, two dry-goods stores located on Broadway, advertised “Wedding and Soiree Dresses.” Shops like these, however, no doubt catered to the wealthy upper class, who could afford the fine items sold there. The Tredwell family probably patronized these establishments. One can only imagine Eliza’s state of mind in the weeks before her daughter’s wedding. Not only did she have to oversee Elizabeth’s trousseau and all it entailed, she was also faced with the daunting task of dressing herself and her FIVE other daughters! There were new ensembles to be purchased (white dresses for those sisters chosen to be bridesmaids); and a hairdresser to be engaged for Eliza, Elizabeth, and perhaps Elizabeth’s sister Mary (who at 20 was considered a young lady). Her wealth would have allowed Eliza to hire a dresser to assist the women with their toilettes. 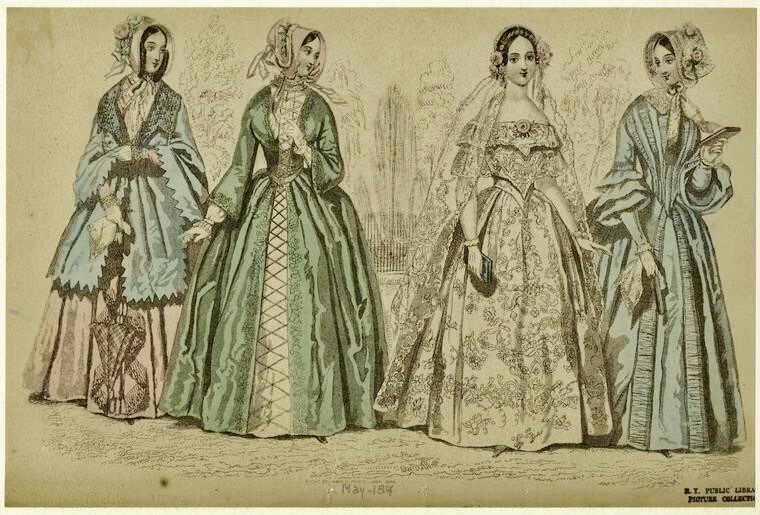 Woman in Bridal Gown with Other Women, 1844, Digital Collections, NYPL. Eliza also bore the responsibility of making sure that Elizabeth’s younger brothers Horace and Samuel (ages 21 and 18, respectively), were properly attired. Whether or not they were groomsmen, because of their age their outfits would have been very similar to Effingham’s (described below). Custom dictated that the groom was also responsible for finding a suitable home for his bride. Effingham was spared this task, however; after the wedding and travel (if any) he simply joined his bride at the Tredwell home on Fourth Street. It was not atypical for newlyweds to live with family, which gave a man time to establish himself in business before buying a home. If a “wedding tour” (as it is called in The Art of Good Behavior) was planned for after the marriage, Effingham made the arrangements, including clearing his work schedule for anywhere from two weeks to one month to accommodate his absence. Embroidered Silk Wedding Waistcoat, American, mid-19th century. Metropolitan Museum of Art, C.l.55.1.17. In the 1840s, a colorful, embroidered waistcoat was a fashionable item in a groom’s attire. 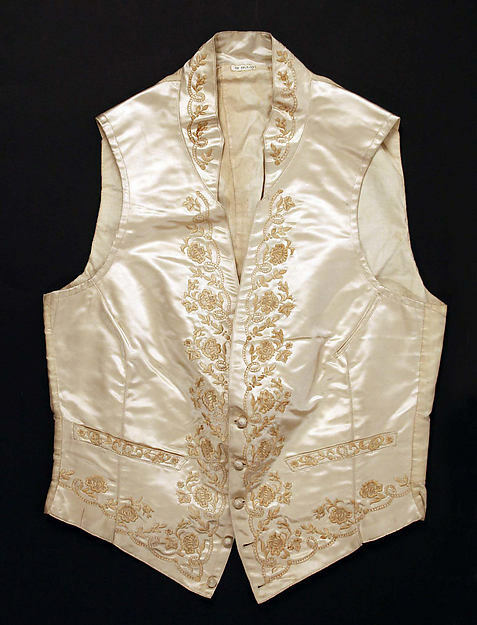 The waistcoat was occasionally worked by the bride, and presented as a wedding gift to the groom. Elizabeth may have shopped at William T. Jennings on Broadway, which advertised in 1844, “a lot of rich silk and satin vestings, suitable for ball and wedding vests,” for material for Effingham’s waistcoat. The task that probably had the greatest significance for Effingham was purchasing Elizabeth’s wedding ring. The fashion for wedding bands was plain, thick gold. Although jewelry store advertisements were plentiful in newspapers in 1845, only one, William Wise, located at 79 Fulton Street in Brooklyn, offered “gold wedding rings” for sale. To ensure that the ring was properly sized for his bride, according to the Etiquette of Courtship and Matrimony, the man must: “… get a sister of your fair one to lend you one of the lady’s rings.” One can just picture Effingham convincing Mary to secretly remove a ring from Elizabeth’s jewelry box! Till her young sisters wreathe her hair in flowers. Stay tuned: the next blog post will cover the wedding day! This exhibition explores the changes in wedding customs as the 19th century progressed, including the trousseau, printed invitations, and the giving of gifts. Highlights include Eliza Tredwell’s 1820 empire-style embroidered cotton wedding dress and Sarah Ann Tredwell’s 1872 silk bridal dress made in Paris, the highest fashion of the post-Civil War bustle period.Save the Date! Saturday, June 9, 6:30 to 8 p.m.
Join us in the museum’s Greek Revival double parlor as we recreate the 1845 wedding Elizabeth Tredwell and Effingham Nichols. After the ceremony, guests are invited to join the bride and groom in the garden for cake and light refreshments. 19th century attire is encouraged. Bradford, Isabella. “A Fashion Worth Revisiting? A Bridegroom’s Embroidered Wedding Waistcoat, 1842.” Two Nerdy History Girls. Tuesday, November 11, 2014. www.twonerdyhistorygirls.blogspot.com. Accessed 4/4/18. The Brooklyn Daily Eagle. Wednesday, March 5, 1845, p. 3. www.newspapers.com. Accessed 4/6/18. Coles Family Papers, 1803-1859. Manuscripts Division, New-York Historical Society. 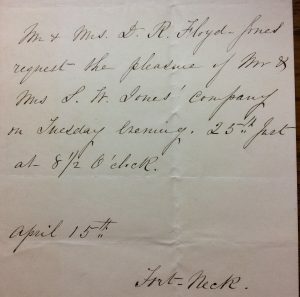 David R. and Mary Floyd-Jones Invitation, 1854 April 15, Floyd-Jones Papers. Manuscripts Division, New-York Historical Society. “Etiquette of Trousseau.” Godey’s Lady’s Book. August, 1849. The Evening Post. Tuesday, 16 January, 1844, p. 3. www.nespapers.com. Accessed 3/6/18. The Evening Post. Friday, 26 January, 1844, p. 4. www.newspapers.com. Accessed 3/13/18. The Evening Post. Friday, 6 September, 1844, p. 1. www.newspapers.com. Accessed 3/6/18. The Evening Post. Saturday, November 16, 1844, p. 2. www.newspapers.com. Accessed 3/21/18. The Evening Post, Monday, 10 March, 1845, p. 2. www.newspapers.com. Accessed 3/30/18. Hartley, Florence. The Ladies’ Book of Etiquette, Fashion, & Manual of Politeness. Boston: G.W. Cottrell, 1860. www.gutenberg.org. Accessed 3/15/18. Haven, Alice B. “Incompatibility of Temper.” Godey’s Lady’s Book. January, 1862. Lester, Mary H. Diary, 1847-1849. Manuscripts Division, New-York Historical Society. Low, Harriet. Diary, 1844-45, Low Family Papers, 1750-1900. Manuscripts Division, New-York Historical Society. New York Daily Herald. Tuesday, 27 February, 1844, p. 1. www.newspapers.com. Accessed 3/13/18. New York Daily Herald. Saturday, May 18, 1844, p. 3. www.newspapers.com. Accessed 3/11/18. New York Daily Herald. Thursday, April 24, 1845, p. 1. www.newspapers.com. Accessed 3/16/18. “New York Fashions.” Buffalo Daily Courier. Monday, 5 November, 1849, p. 3. www.newspapers.com. Accessed 3/18/18. New York Tribune. Saturday, 28 December, 1844, p. 3. www.newspapers.com. Accessed 3/7/18. O’Neil, Patrick W. Tying the Knots: The Nationalization of Wedding Rituals in Antebellum America. Dissertation Thesis, University of North Carolina, Chapel Hill, 2009. www.cdr.lib.unc.edu. Accessed 3/15/18. Patterson, Henry. Diaries, 1832-1848. Manuscripts Division, New-York Historical Society. Pinckney, Cotesworth, ed. The Wedding Gift, To All Who are Entering the Marriage State. Lowell: Milton Bonney, 1849. www.babel.hathitrust.org. Accessed 4/5/18. Reeves, Emma. History of the Bridal Trousseau. September 15, 2016. www.theribboninmyjournal.com. Accessed 3/18/18. Rothman, Ellen K. Hands and Hearts: A History of Courtship in America. Cambridge: Harvard University Press, 1987. Tailer, Edward Neufville. Diaries, 1848-1917. Manuscripts Division, New York-Historical Society. Thornwell, Emily. The Lady’s Guide to Perfect Gentility: In Manners, Dress, and Conversation. New York: Derby & Jackson, 1856. www.archive.org. Accessed 1/17/18. Tredwell, Phebe. Letter, November 1, 1854. Nichols Family Papers. Manuscripts Division, New-York Historical Society. Victoria and Albert Museum. “History of Fashion 1840-1900.” www.vam.ac.uk. Accessed 4/4/18. Wallace, Carol McD. All Dressed in White: The Irresistible Rise of The American Wedding. New York: Penguin Books, 2004. “Wedding Memories: The Bride’s Trousseau.” Magpie Wedding. www.magpiewedding.com. Accessed 4/9/18. Hi, I’m interested in the John Forrest “wedding” picture… I’m not having any luck online.. where did you find that image? 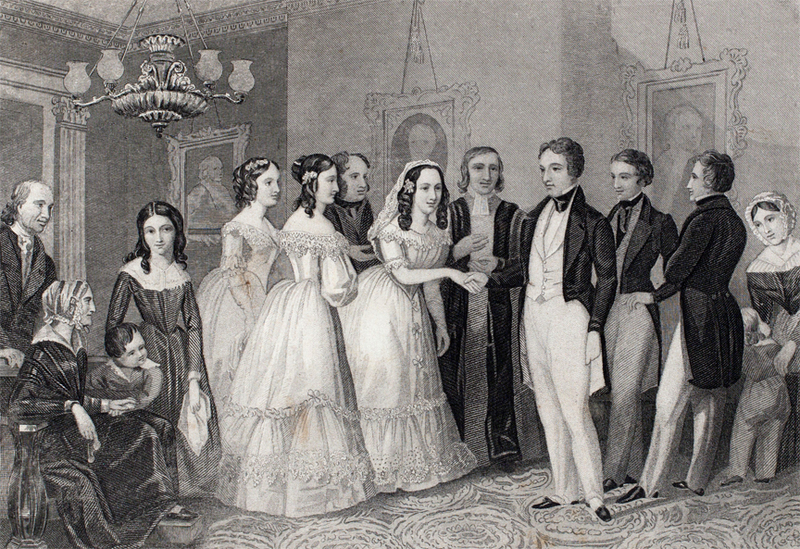 The engraving of “The Wedding” can be found in the collection of the American Antiquarian Society. It’s also available on Wikipedia Commons — you might have better luck searching for John B. Forrest or J.B. Forrest. Many surprises in this blog. Particularly interesting to me was the contrast between the cost of the wedding dress and the simplicity and downright casualness of the ceremony; all that money for a dress few would see. Was it considered okay for a bride to wear her dress for subsequent occasions? Overall, I admire the way Annie scrupulously tells us what she doesn’t know and then interestingly fills in the blanks with well-documented inferences. Great work! Research tells us that the bride traditionally wore her bridal ensemble when she and her husband received callers (their first as man and wife), in the first few weeks after the nuptials. Typically, the day and time they would be receiving was conveyed in a fun way, but you’ll have to wait for the next installment to learn what that was! Also, for the reason you mention, a bride would often have her dressmaker make another bodice that could replace the original, thereby making the dress useful for other social occasions. Thanks so much for your inciteful comments, Liz! This is a wonderful, informative post, based on the exhaustive research we have come to expect from you! Shows how important it is to understand the historical context of the Tredwells’ lives. Like Liz I am surprised at the extensive preparation and amount of money spent on the trousseau and the casual offhand way the actual wedding came off. Today it seems there is less emphasis on accumulating the trousseau (and surely nobody is embroidering their underwear in anticipation of the event) and an extreme emphasis on the theatricality of the actual ceremony.